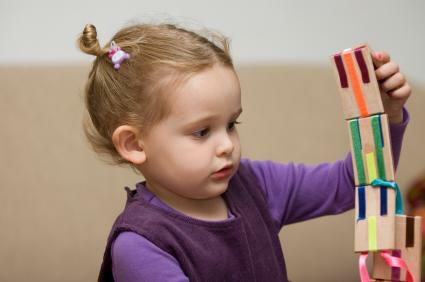 Pique your child's interest in learning new things at an early age with toddler educational games and toys. Buying an age appropriate toy is just as important as the type of toy you buy. Here is a short list of educational toys and games for toddlers, broken down by age. Leap Frog Fridge Farm Magnetic Animal set - Your child will learn all about farm animals as well as develop fine motor skills with this fun and educational game from Leap Frog. Large Wooden Puzzles - These simple puzzles help your toddler to develop both large and fine motor skills as well as help to develop cognitive and problem solving skills. Bright Tots Educational Toys - Bright Tots offers educational toys for a variety of age groups. Creativity Institute - This toy company offers all sorts of educational toys from puppets to pianos. Fisher Price Laugh and Learn Series - This series offers educational toys and games for children ages 6-36 months. Educational Toy Planet - This company specializes in unique wooden toys. Fisher Price - Check out Fisher Price's Learn Through Music, Fun 2 Learn and Imaginext toys and gamesfor this age group. Educational Toy Planet - Get an Express Preschool Laptop or a Match It! Sequencing Educational Puzzle game for your budding genius. Genius Babies - This company offers a wide variety of learning toys and games perfect for your preschool aged child. e-Beanstalk - The Hopscotch Floor Tiles and Color Me Floor Puzzle will provide hours of fun and learning for your children. Toddler educational games are fantastic way to augment your children's cognitive, motor skill and problem solving development, but toys alone will do not completely educate your child. Children love playing and love playing with their parents most of all. So, buy educational and then sit down and spend time playing your children. Taking the time to play with your children can sometimes be difficult with the chaos that is today's modern society. After you get home from work, pay the bills, take a shower, do the laundry and balance your checkbook after your child goes to bed. Both you and your child will get immense satisfaction by spending time together that no toy can ever give either one of you.